Mom is here! She flew in from New Hampshire today. The 3,000 mile distance is rough, but the long visits totally make up for it. The kids had her reading Mickey Mouse books to them about fifteen minutes after she walked in the door. So precious, I can’t even. Also, my kids love Mickey Mouse books. We have a set of Disney treasuries and a few “flip this book over and there are actually two stories” Mickey books, but that’s it. Where are all the Mickey books? Surely there is a market for them! Anyway, that was the sweet part of the day. Zach came home, we all ate his corned beef and cabbage (so good) and my Irish soda bread (which I totally messed up – I didn’t pay attention, and essentially dumped all of the ingredients into a bowl before realizing that I was supposed to use the buttermilk and egg separately – but miracle of miracles, it was really good. Just moister than your typical Irish soda bread), and then it was bedtime. I want to go back in time and punch that version of myself in the face. I don’t care that I was pregnant at the time. I would still punch myself in the face. Why won’t my kid sleep anymore? Why is she so in-your-face mean to me? I thought things were supposed to ease up at the end of her second year! I love your blog, Renee, and the pictures are beautiful! I know your mom is thrilled to be with you, and I’m sure the feeling is mutual. 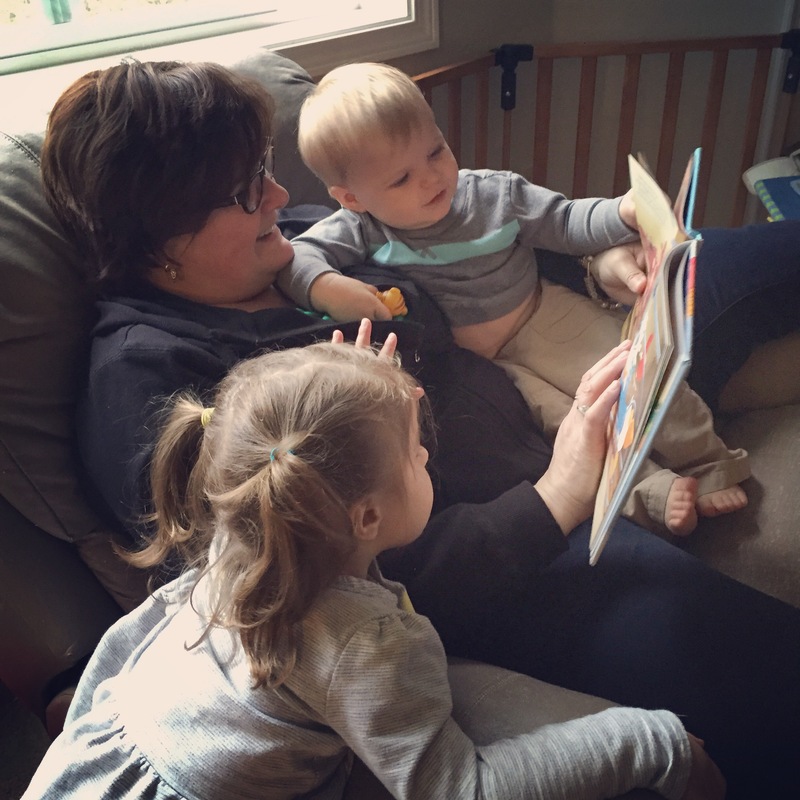 She is soaking up all the love that her adorable grandchildren have been saving up for her visit. I have a funny feeling that those two little ones are going to be VERY smart! Oh…and keep on writing, Renee!